The day had finally come and I was going to fly one of the newest planes in the sky, the 747-800 intercontinental! I have flown the other two new wide body planes recently (China Southern A380, Korean Air A380, and United’s 787, click each for a review) and I was more than ecstatic to mark another first off my list. The plane is a beautiful as the original 747, but with an extended upper deck and curved wings similar to the 787. The plane is distinctive and has one of the most beautiful silhouettes. Lufthansa now operates a number of 748i on three routes from Frankfurt to the United States, LAX, DC, and Miami. My flight was to Washington DC in business class and not only was this my first time flying transatlantic business class on Lufthansa, it was my first on the 747-8i! Check-in at the massive Frankfurt International Airport could not be any easier for a business class passenger. There are a number of check in facilities for economy passengers, but business class passengers have their own separate check in with at least 10+ agents working. In addition, Star alliance gold passengers and First class passengers are also separated in another check in hall/area making check in for all easy, no matter what class of service one is flying. My check in agent was extremely friendly, quickly tagged my luggage, printed my boarding pass and directed me towards my terminal and informed me where the closet lounge was located. I love traveling in Europe because it is almost as easy as pre 9-11 days (yes, the laptop still has to come out). The agents are friendly and people are not as irritable as they are in the USA. Either way security and passport control was very easy. Since the Frankfurt Airport is broken down into multiple terminals, the lines where short and easy. There were two lines, one for passengers in economy and another for business/first class passengers. The wait at passport control was less than 5 minutes and the same set up holds true for security screening. There are agents along the way to ensure passengers are using the correct line based on class of service. I was busy sitting in the business class lounge, not paying attention to time, when I noticed that per my boarding card, boarding had begun 20 minutes ago. I quickly headed to the gate as the monitors also said boarding. As I was walking hastily, I heard a final boarding announcement made so I doubled my pace. When I arrived at the gate, it appeared as though boarding was completed and there was no line at all. Clearly, I was late! I proceeded to the area that said “business class”, scanned my own boarding card, and the gate opened. The agent glanced over at me and smiled and wished me a pleasant flight. I really enjoyed the automated gate, and thought it was a cool touch! I wish every airport had this feature! I was about half way down the jetbridge when I realized I had left my bag of duty free items in the club! I quickly walked back to the ramp and ask the gate agents if I had time to retrieve my items. She looked at her supervisor who nodded and they asked me to hurry. I RAN back to the lounge, found my bag exactly where I had left it, and ran back to the gate. Out of breath, the ordeal took me a good 5 minutes point-to-point, but I retrieved my items and made the flight! Once on board, I was greeted by the flight attendants and pointed towards the stairs. Once upstairs, another flight attendant greeted me and directed me towards my seat. I started to store my items overhead, but then quickly realized the seat next to me was empty and recalled from check in that it wasn’t assigned. So instead of storing things in the overhead bin, I quickly took advantage of the bins along the fuselage. Shortly after sitting down, I was offered the typical champagne, water, or orange juice and another FA offered customers reading material. Once everyone was on board (seriously only a few minutes after I boarded) we taxied and headed towards the runway. Within minutes the engines were roaring and the jumbo jet gracefully lifted from the ground and we ascended to our cruising altitude while circling over Frankfort, providing great views of the city and countryside. The 747-8i take off was EXTREMELY smooth and despite being a large plane with four massive engines thrusting, the upper deck was extremely quiet and peaceful! Within 45 minutes of flight, FAs were up and active in the cabin, flight attendants passed out menus, and drink service began immediately. Service throughout the entire flight was amazing. Flight attendants were all smiles and extremely professional. They knew the wines they were serving and were quick to offer their recommendations when asked. At one point, I even walked backed to the galley to ask the FA about a couple of drink choices on the menu I had never heard of. After explaining the three drinks to me, he offered me a chance to try them all. Never hearing of them I took the opportunity to try all three! I figured heck, why not?! It was a mini in flight tasting, something I had never done before! I also had a chance to talk with another FA midflight, when most passengers were sleeping and I was restless. She was extremely friendly and filled me in on why she loved the 747-8i. Most of it was aesthetics and because of the history of the plane. She also just thought the A380 was too massive. Nevertheless, the FAs were all professional and friendly. It really did make a huge difference! Also, at the beginning of the flight, an announcement was made that there were FAs on board who spoke Germany, English, French, Dutch, Spanish, Portuguese, and Luxemburgish. It was great to see so many languages offered; other major airlines could truly learn from Lufthansa. Dinner Salad with a choice of one of three appetizers. Steak with local white asparagus. Salmon in a butter cream sauce and risotto. Spinach pasta in a gorgonzola sauce. Fruit Salad or rhubarb white chocolate soufflé. For my appetizer, I had something with white asparagus and goat cheese which was delicious. The other options included something with veal that I saw three people hand back for something else that sounded even less appealing. Everything I had was delicious and I was very satisfied with; full of flavor and not overly salted. Fish is hard to do at 30K feet and it was a bit to saucy, but I still enjoyed it. Dessert was sweet and simple and since rhubarb is one of my favorites, I was in a state of delightful bliss! About 1.5 hour before landing in DC, a cold lunch was also served. The Soup and salad was good. I ventured out and tried the prosciutto and almost spat it out immediately. WAY too salty! But I think this is normal for prosciutto, what do I know, I rarely eat meat! No snacks/service was offered between meals, but there was small snack basket with cashew nuts near the galley. Nothing like what I’ve seen on other airlines with walk up bars/snack areas. 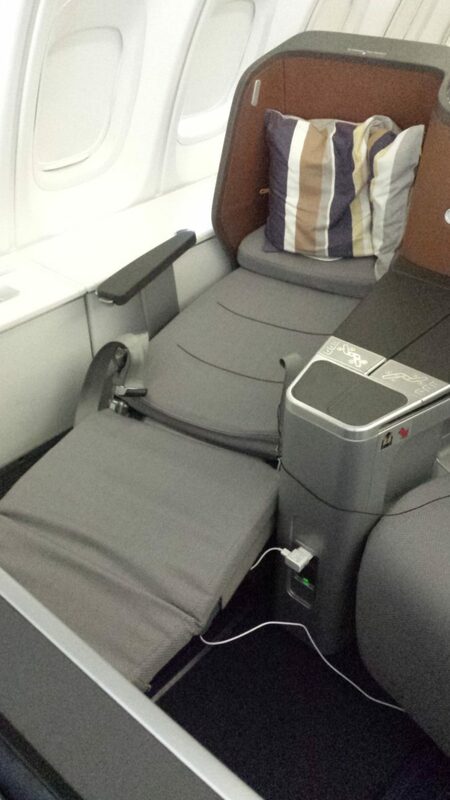 The seats on Lufthansa’s 747-8i are VERY similar to the product that United has on their 787 (see my review). The seats on the upperdeck are in a 2×2 configuration and are a 2x2x2 on the main deck. This is great for those traveling in pairs, but for those traveling alone, it can make for some awkward situations as you try to climb over your seatmate to use the bathroom. In addition, the seats are angled towards each other so if you wiggle too much, you may just end up playing footsie with your neighbor while sleeping! The seat does recline into a full flat bed, so this is a huge improvement over Lufthansa’s angled flat seats, but at just over 6 feet, the taller person may feel crammed! There is also very limited storage around the seat. There is a small cabinet near your feet, which is outfitted with a bottle of water and an amenity kit. Shoes can easily fit in these as well. Under the foot rest there is also a place for a small bag/brief case. Otherwise, there is no real storage at the seat. Seats on the second deck along the fuselage do have bins so this does increase the storage space substantially, otherwise customers will need to use the overhead bins. The IFE is integrated with the seat and provides hundreds of hours of entertainment. There were very few blockbusters hit showing while flying, and most movies being shown were actually 3-10 years old, and some even older. Despite the somewhat lousy selection, it still beats overhead TVs! The IFE also includes exterior cameras, moving maps, TV shows, games, and more. As far as sleeping in the seat goes, I would say it is fairly comfortable. I only took a short nap as this was an afternoon flight, but regardless the seat worked well for me. The blanket was lightweight, but better than the Swiss Air blanket I had from NYC- GVA (review here) and the pillow was only alright. I stole a second pillow from an empty seat for added comfort and I would highly suggest you do the same if trying in business. Amenity kits on the plane were pretty basic and included socks, ear plugs, toothbrush and an eye mask. Lotions, mouthwash, shaving kits, and combs were located in the business class bathrooms. I noticed that the mouthwash ran out after the first meal and were never replenished. The material of the business class kit appears cheap and flimsy. Probably among the worse business class amenity kits I’ve seen. There was also a lot of reading material on the plane, including a number of good magazines such as the Economist and Time. The only problem is they are kept in the storage above the seats in the exit row, which means people are constantly standing over these seats looking for reading material. I would highly suggest not sitting in this row! Headsets in business class were built into the seat and covers for the ears were found in each amenity kit. Headsets were flimsy and appeared cheap, not noise cancelling. Therefore be sure to bring your own if you have them. Lufthansa offers a solid product to get you from point A to point B. The airline service is top notch and the crew members all are pleasant. Some of the amenities and dining options are lacking. This could be why Lufthansa is only a 4 star airline and not a 5 star. There is room for improvement when comparing the airline to, say: Korean, Asiana or other Asian carriers, but nonetheless for a “western” airline I was impressed. I am not sure if I enjoyed my experience any more than I have on a Delta flight configured with their lay flat seats (such as my flight NRT-LAX), but either way the flight was overall a good experience and I would recommend Lufthansa for a transatlantic flight in Business. As far as the 747-8i goes the plane is a beauty! I have always loved the 747 family and this one will continue to be among my favorite planes. The plane is quiet, sturdy and lands smoothly and takes off like a paperweight. I love the sky interior and the larger overhead bins and larger cabin windows! I hope more airlines order this plane because it is truly a unique plane!